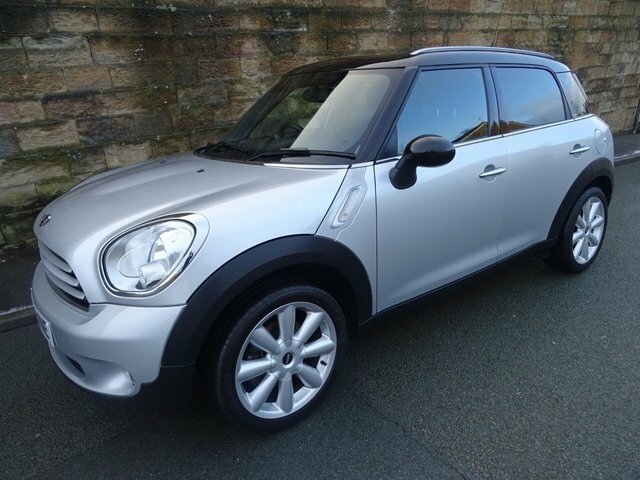 A Stunning Low Mileage High Spec Example Of This Popular 5 Seater Mini Countryman With Full Mini Service History And 2 Keys.Crystal Silver Metallic Paintwork With Jet Black Roof And Mirror Caps, Aluminium Roof Rails, Cosmos Black Half Cloth - Half Leather Sports Upholstery,Upgraded Mini 5 - Star Double Spoke Alloy Wheels. A Great Spec Car Which Includes Chilli Pack, Bluetooth Telephone Connectivity With Music Interface For Smartphone,DAB Radio Tuner With Mini Boost CD Player,Rear Park Distance Control Cruise Control,Multi Function Leather Sports Steering Wheel,Heated Electric Door Mirrors With Folding Function,Chrome Line Interior,Auto Dipping Interior And Exterior Mirrors,Sun Protection Glazing,Front Centre Arm Rest,Storage Compartment Package With Flat Load Platform,Anthracite Headlining,Interior Surface Piano Black,Automatic Air Conditioning,Interior Lights Package,Front fog Lights, Electric front Windows,Remote Central Locking With 2 Remote Keys And Much More. MOT, Service And Warranty Included In The Price.